Cast and flowformed aluminium alloy. Tarmac rally and race wheels. Known as the "Turini" wheel, the world's first Flowformed motorsport wheel. Available in road & motorsport specification. 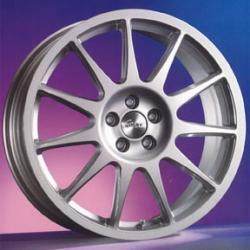 Motorsport spec wheel has thicker rims and is supplied without centre cap/bolts. Instantly recognisable and iconic in equal measure. This wheel has become the first choice for professional teams worldwide. Suited to a wide range of motorsport disciplines from tarmac rally, to circuit racing and rallycross.